Once one or more modems and/or SMSCs are defined, additional options are displayed under the “SMSC” tab. The “Properties” button allows you to configure properties for the selected connection. 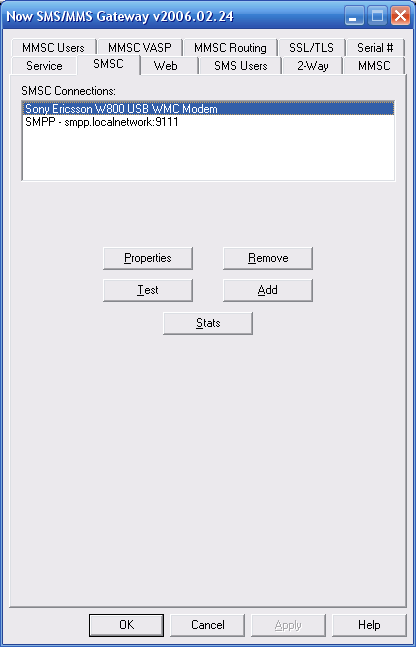 For SMSC connections other than GSM modems, the standard configuration dialogs appear. For modem connections, the Routing Options dialog will be displayed, defining what SMS message recipients should be routed via this connection. The “Test” button allows you to test the selected connection and confirm that the gateway software is still able to communicate properly with the modem or service. Note that if the gateway service is currently active, the service will be temporarily stopped while the test is running. The “Remove” button allows you to remove the selected connection from the configuration, so that the gateway will no longer attempt to use the connection. After changes are made, use the “Apply” button to save any changes. Use the “Ok” button to close the dialog.